In the preceding post (See Geneva – Introduction) I mentioned that there was a third factor that convinced me to go on vacation this year. I worry about being away because I don’t like leaving our animals, particularly our dog, Harley (I don’t worry so much about the cat. Cat’s are pretty independent and as long as she gets regular food and water and little human contact every day she seems to be happy enough. We can provide that easily enough by having someone come to the house every day). The dog is another story, however. Somewhat irrationally I don’t like kennels so that option is out. We used to know a couple who took dogs into their home. This worked well for us and the dog seemed to enjoy it too. Unfortunately, after a while they decided that they no longer wanted to do it and we have, so far, not been able to find a replacement. So with no viable option for looking after the dog while we’re away I’ve tended to stay home. This time there was considerable pressure from both my wife and my daughter so I felt the need to find some way of going. What we decided to do was to take the dog with us. When I was posted to Geneva in 1990 we took a cat with us. When we lived in France the cat moved too. And when we returned to NY in 1998 the cat came back with us. So we weren’t totally unfamiliar with the process: get a microchip implanted; get all of his shots done (even if some of them were still valid they all had to be done AFTER the microchip was put in; take all of the documentation down to JFK to get them stamped by the Dept. of Agriculture. Luckily Harley is a small dog and so we were able to take him into the cabin with us. We had to get a carrier of an improved size. This had to go under the seat in front, and he had to stay in the carrier for the duration of the flight. It turned out that he is an exceptionally good traveler. He’s a very sweet dog, but if he has a failing it’s that he likes to bark a lot. 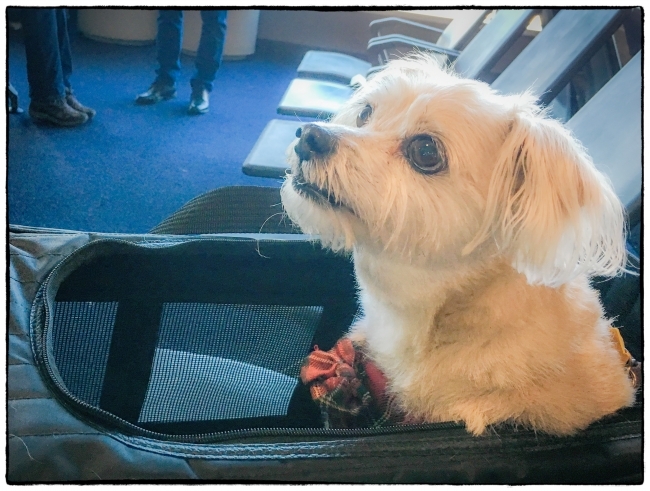 I had visions of us waiting to board and being refused because he was barking a lot. Instead I was surprised that from the time we put him in his carrier at home to the time we got off the plane in Geneva he barked only once. This was on the plane and only then because another dog in the cabin barked first. On the way back he didn’t bark at all. At the end of both trips he jumped out of the carrier as if nothing out of the ordinary had happened. So Harley too is an international traveler having now been to Switzerland and France. In the above picture he’s sitting in his carrier as we wait to board. Picture taken by my wife with her iphone 6s.